I admit when I choose my soap it has to look nice and coordinate with the room it is going to be in. The soap also has to has a nice scent. I have to wash my hands several times a day, it might as well be a pleasurable time with a nice aroma. I am the only one who smells my hands as I am washing them? I like to take a deep whiff of my soap as I am scrubbing my hands and take in the scent. Since the standard hand wash procedures tell us to wash to the tune of Happy birthday 2 times( 20 seconds), I might as well enjoy the scent of the soap. I think the folks at Softsoap must be thinking the same way that I do when they created the New Softsoap Fragrant Foaming Collection. I just love the new scents in this collection of soap. They have scents for every room in my house that has a sink. There is one for my kitchen, half bathroom, and master bathroom. These soaps not only have great scents but they also brighten and beautify my sinks in each room, thus making hand washing an event that awakens my senses. The soap also pampers my skin as it gently cleans. 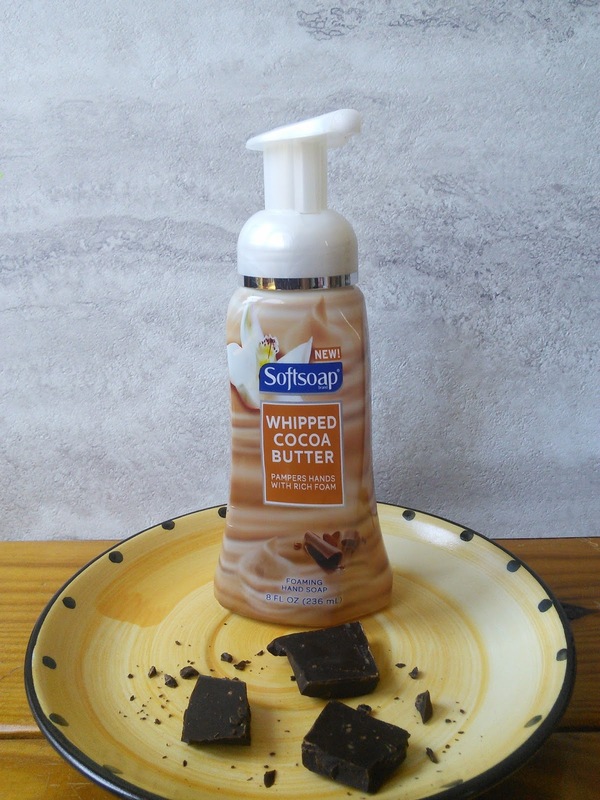 My downstairs half bath welcomes my guests with Softsoap's Whipped Cocoa Butter. This soap has a rich foaming lather that is infused with cocoa butter extract. The yummy decadent scent reminds me of a chocolate treat. OK, I admit, I might just have washed my hands more than once with this soap. 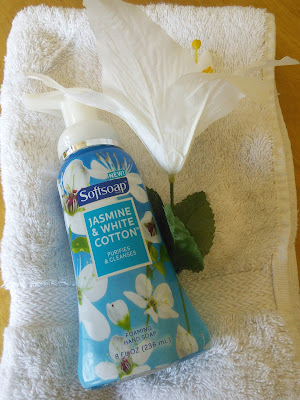 My master bathroom looks wonderful with the blue bottle of Softsoap's Jasmine and White Cotton. This soap has a fresh scent of flowers and clean cotton clothes. It makes washing my hands before bed very relaxing and helps me drift off to sleep. The Kitchen Citrus Bliss awakens my senses with the crisp sun-drenched scent of citrus fruit. The bottle brightens up my kitchen too. This soap energizes my mood while it cleans and soothes my skin. 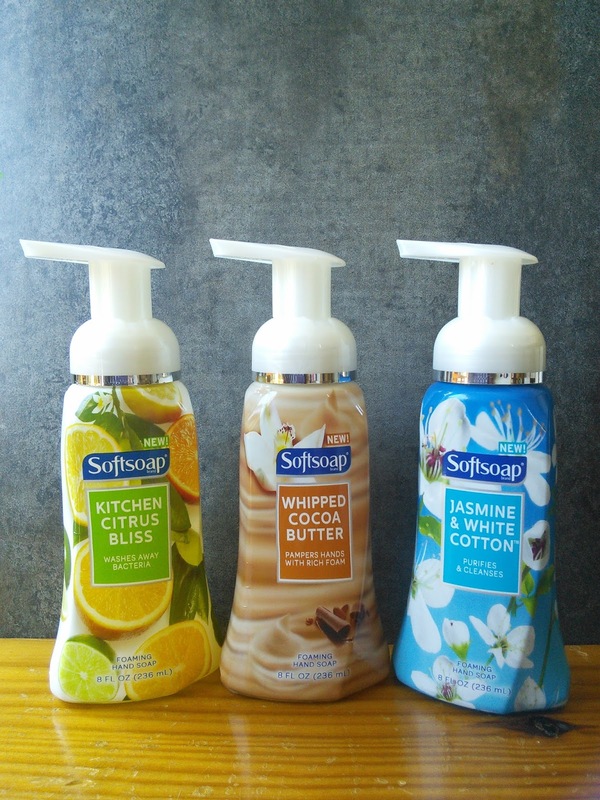 So which scent from the Softsoap Fragrant Foaming Collection do you want to wash your hands with? These soaps can be found in stores like Target, Walmart, Walgreens, CVS, Riteaid, Kroger, and other large food stores. Visit the website of Colgate-Palmolive to discover more about these wonderful hand soaps. Soap that smells like chocolate? YES please! I need to get some. Who doesn't want a yummy smelling soap?? I love lemon scents and cocoa butters. I would love these! I did not realize Soft Soap had developed such lovely scents! Will check them out. Thanks! I think that I would keep washing my hands if our soap smells that good hahaha. It matters to me too ... I like taking a deep whiff and voila, I'm happy. I love softsoap. I buy it often and everyone just loves the scents. Such great stuff. I dont think I realized SoftSoaps had these scents! I love SoftSoaps, so will have to check these out next! These hand soaps must smell delightful! I'm curious about the chocolate scent! The Jasmine one sounds like it would smell great. I love scented soaps that aren't too strong. I'll have to try these out. 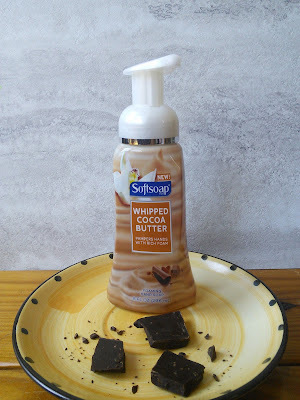 You had me at Whipped Cocoa Butter, I would want to smell that one! I wash my hands all day, too and like coordinating the bottle with the room. I use this brand but haven't tried any of these. I know what to pick up now when I'm out of soap. OMG I have never heard of a chocolate scented soap before!!! Too cool! I have not heard of Soft Soap until now. I would love to try the chocolate scented one! I want this kind of soap. Yummy smelling soap indeed! Love Softsoap! 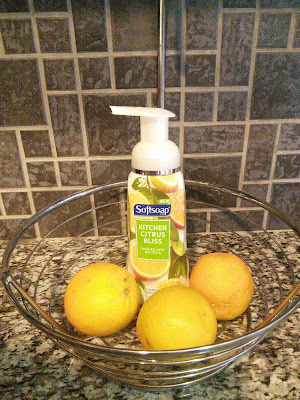 I will have to try the Citrus Bliss, I love citrus scent for hand soap. I the whipped cocoa butter, yes please. I know it smells amazing. Thanks for sharing!